The County of Morris and the Morris County Municipal Utilities Authority cooperate to provide the County of Morris' in-house, workplace recycling program. 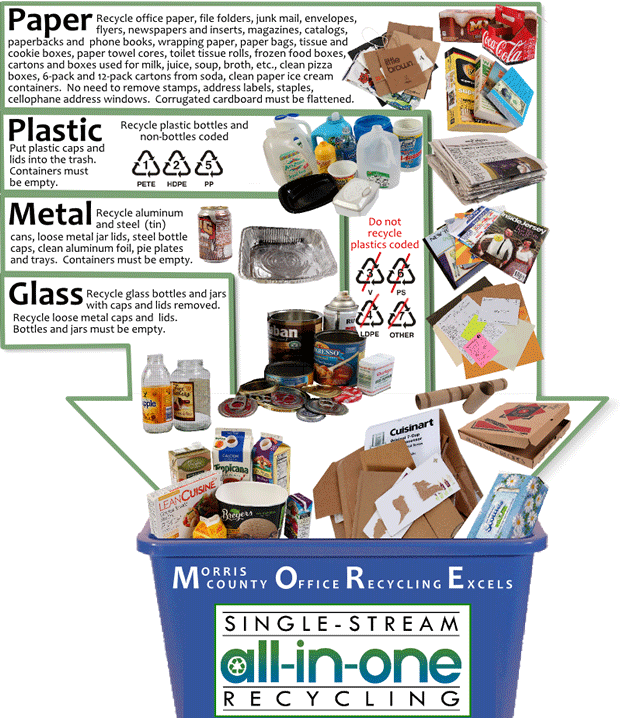 The recycling program is called M.O.R.E., which stands for Morris County Office Recycling Excels. Use this information to help determine how and what to recycle when at work for the County of Morris. The “all-in-one,” single-stream recycling collection program allows cans, bottles, cardboard and all other paper to be mixed together in the same container. All items must be empty and free of food residue. Please put all shredded paper (by itself) into clear or light-colored plastic bags (no black plastic bags). Do not mix any other paper, recyclables or trash with shredded paper. 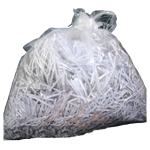 Shred only confidential or personal information; there is no need to shred everything. Please put all other recyclables into designated recycling containers. Click here to view and/or download a letter-sized (8.5" x 11") PDF flyer of the M.O.R.E shredded paper preparations and recycling flyer. Q. Can we recycle rechargeable batteries with Call2Recycle® ? Call2Recycle® will provide free-of-charge drop-off boxes to any public entity for the collection and recycling of their own rechargeable batteries. All one has to do is sign up online at http://www.call2recycle.org. Public drop-off sites open to the general public will be listed on the Call2Recycle® zip code locator and toll-free help-lines to encourage residents to recycle. Additionally, institutions can still participate in the Call2Recycle® program without being advertised as a public drop-off location if they do not want to listed as such. Since everything is free of charge, the MCMUA is encouraging every county department to request a drop-off box for its office or work site if they generate more than a handful of rechargeable batteries each year. For those public entities that utilize 2-way radios such as police, fire, public works and emergency services, the Call2Recycle® program is a great way to conveniently manage the rechargeable batteries that are generated and need to be recycled. Click here for more information about household battery recycling/disposal.